We had been to temple yesterday and gurukkal gave two apples to my girls'. Even if the apples are sweet, my girls' will not eat, but those apples were sour. No body wants to eat those apples (including me!). Just took a small piece as prasadham. I was looking for some apple pickle in the internet. Even though I got few recipes, I didn't want to do it. So I tried this curry by myself and it came out really well. Pre heat oil in a pan, splutter mustard seeds and cumin seeds, add onion and tomato and stir it for a minute. Now add the apple pieces, add turmeric powder, red chillies powder and salt. Add required amount of water to let the ingredients cook. It will take 10 mts to cook apple pieces. When it is fully cooked, add the garam masala powder and mix it well. Saute for another two minutes. Garnish it with coriander leaves. Its really good to eat with rice and chapathi. ur two recipe,apple curry and fried idly are really different.i wish to taste them. Never cooked sabji with apple, very interesting. what kind of Apple have u used green or red? Thanks siressha. Yep it was spicy, sweet and salty. 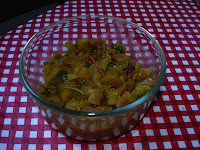 I have never tried dhall with apple deesha, will check out ur blog for recipe. Yep Ramya, its different, even this is the first time for me. 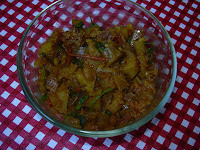 Try it once Medhaa, I am sure u will like it. Wow! You made curry with the apples? You know what, I have never heard of savory apple dishes so far. Thanks for teaching me something today! Just saw apple dhal in deesha's blog and now your delicious apple curry. a fruity feast is in the air!